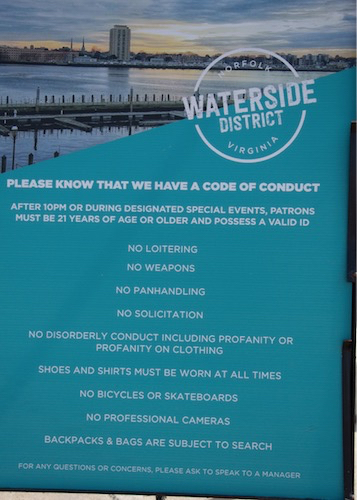 I found that sign displayed outside of a waterside tourist space during a recent trip and there’s nothing particularly remarkable about this list of rules. It’s the kind of stuff you might expect in any place with drinking crowds. I certainly want the “No weapons” restriction in a bar. Then we come to the line “No Professional Cameras”. I’m pretty sure whoever wrote that rule was thinking of a camera like the one used to make this image: a relatively big, black, single-lens reflex with interchangeable lenses. The variety of device you might expect to see in the hands of a paparazzi while stalking a Kardashian. Except mine is not a “professional” camera. I’ve never been paid a dime for any image I’ve made with it. I’ve never had a job that required me to use this device. I’m not a professional photographer, so this is not a “professional” camera. Now, I’m certainly not going to complain directly to the management of this establishment about that one line. Their place, their rules. I’m just pointing out this single, relatively minor entry in the unfortunately long list of examples of the modern day fear of photography. Like the Metro cop who told me I couldn’t take pictures on the platform 1For the record, it is perfectly legal to take non-commercial photos in the DC Metro, without a tripod, except at the Pentagon station. and then walked past a group of kids doing exactly that with their smartphones. Or the security guards in DC who questioned me for pointing my camera at an interesting reflection in the window of a government building from a public street. Do a quick Google search and you’ll find many, many similar stories, some with far worse consequences. My point to this somewhat lame post is, cameras are everywhere, in the hands of just about everyone. Trying to ban or limit their use, especially by calling one particular style “professional”, is going to be an exercise in frustration. Far better to ask people to be respectful of others when making pictures. Doesn’t always work, but still better. Ok, I’m done ranting. Thanks for reading this far. For those interested, the ACLU has a short, simple guide to photographers’ rights. If you use a camera of any kind in public, read it. Well, this one slipped by me. It seems that the AP World History teachers at one of the high schools here in our overly-large school district have banned students from using anything they find on the internet in their work. Along with thoughts and ideas from pretty much any living source. What about complete strangers? The teachers had thought of that. “You may not discuss/mention/chat/hand signal/smoke signal/Facebook/IM/text/email to a complete stranger ANY answers/ideas/questions/thoughts/opinions/hints/instructions.” The words were playful, but the teachers were serious. Any violations, they said, would mean a zero on the assignment and an honor code referral. Our school board says that our students will learn to “ï»¿Effectively use technology to access, communicate, and apply knowledge and to foster creativity.” Not to mention all that stuff about learning to work collaboratively. In these classes access is limited to what’s delivered on paper and any communication or collaboration at all will get you the academic equivalent of the death penalty. This attitude takes the traditional role of teacher-as-sole-arbiter-of-knowledge and injects it with steroids. None of this, however, is at all surprising considering the intense paranoia over plagiarism in our schools. But these days is there any value in an assignment that requires students to work completely in isolation? Was there ever? Thanks to @jonbecker for tweeting this to my attention. Karl wonders if we shouldn’t get rid of school Acceptable Use Policy statements (“So are they really UUP’s — Unacceptable Use Policies?”) and replace them with RUP’s – Responsible Use Policies. Instead of making a list of all the things you can’t do with technology and on the Internet, what if we made a list of all the things that not only can you do, but you should do? What if students and staff had to sign an agreement that stated these are all the ways that a responsible student or staff member should be using technology and the Internet if they are to be a functional, literate, contributing member of society? This makes a whole lot of sense, especially considering how we generally use AUPs. In most of our schools, teachers and kids (or their parents) sign the AUP at the beginning of the year. And then everyone promptly forgets about it. Until someone does something a teacher or administrator thinks is a violation at which point we haul out the rules again to support penalizing the offender. RUP’s, on the other hand, would need to be interwoven throughout the curriculum as well as any technology-assisted classroom activity. The rules would become an instructional tool instead of an administrative baseball bat. Now, can we also make some similar revisions to the SR&R’s (Student Rights and Responsibilities) here in the overly-large school district. This is another, broader set of rules, trotted out at the start of the school year and then forgotten until a student does something we don’t like, with far more “responsibilities” (re: UUP’s) than rights.